Wendy McSweeney is the Enterprise Inclusion Leader for SunTrust Banks, Inc., responsible for developing and executing growth and engagement strategies, consulting with executive leaders and driving enterprise wide inclusion and diversity at SunTrust. With a focus on deliberate and inclusive connections with teammates, communities and clients, McSweeney is accountable for linking the internal and external activities of Suntrust’s Teammate Networks to business goals and objectives, providing transformative learning opportunities and effectively communicating the company’s commitment to inclusion. She is excited to have the opportunity to create an environment where her LGBT teammates feel safe and valued for their contribution to the company. A 20-year veteran of the financial services industry, McSweeney has extensive inclusion and diversity, leadership, program management, relationship management, coaching and consulting experience. She chairs the SunTrust Enterprise Inclusion Council and serves as a member of the SunTrust Executive Inclusion Committee. In 2014, Black Enterprise Magazine named McSweeney one of the “Top Executives for Diversity & Inclusion” and the Georgia Diversity Council named her one of the “Most Powerful and Influential Women” in Georgia. 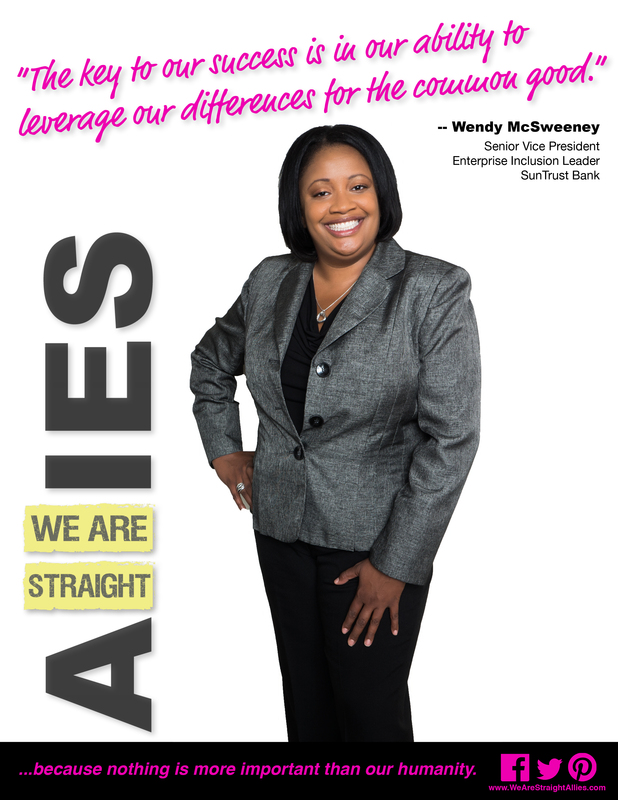 Before joining SunTrust in 2013, McSweeney served as the diverse segments development leader at Wells Fargo Advisors (WFA). In that role, she designed programs to increase productivity and retention of diverse financial advisors and managers and led the new financial advisor sourcing program to recruit new advisors to the business. During her 11 years with WFA, she served in increasingly responsible positions to include business & administration manager of the national sales group and business manager of the business development group. Prior to joining WFA, McSweeney served as a conversion manager for SunTrust Bank’s Retirement Group where she partnered with organizations in Washington D.C., Maryland and Virginia. McSweeney also serves on the Board of Directors of The Brian Jordan Foundation. She is a member of The Network Journal’s 2012 Class of “Forty under 40” leaders in business and a 2010 graduate of the St Louis Business Diversity Initiative Fellow’s Leadership Program. She earned an undergraduate degree in accounting from Virginia Union University and an MBA from the University of Phoenix. Wendy is a registered general securities representative with a Series 7 license.